Crashes on Federal Boulevard between Seventh Avenue and Howard Place are higher than the statewide average. So how have the Colorado Department of Transportation and Denver Public Works responded? By adding a sixth travel lane for drivers and widening the current ones — two actions known to increase speeds and congestion. When it’s completed in 2018, the expansion — which finished its public planning process at the beginning of the year — will span Federal from Fifth Avenue to Howard Place. Where the street currently has two northbound lanes, there will be three, according to preliminary designs. Any lane fewer than 11 feet wide will be jacked up to CDOT’s 11-foot standard. (By comparison, NACTO’s standard for a street like Federal is 10 feet). Pedestrians will get a raised median, signalized left-turn lanes at intersections and, for the first time, legitimate sidewalks that comply with the Americans With Disabilities Act. Adding room to any street makes drivers more comfortable speeding, and creates more space that cars will inevitably fill, making these pedestrian improvements seem like a wash. The project will add capacity for cars, not people, in the name of curing congestion and reducing wrecks between motorists. According to the needs assessment [PDF], conflicts with cars and buses are a big problem on Federal, causing both crashes and congestion. 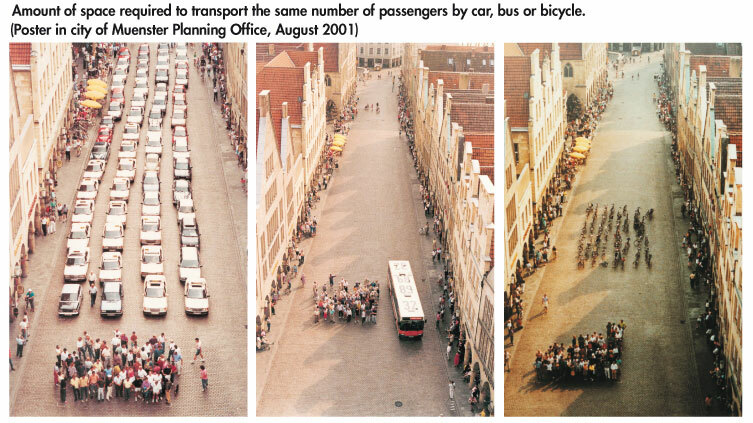 Engineers think that adding space for motor vehicles will allow drivers to pass cars and buses more easily. Bus rapid transit, or BRT, is a better solution for Federal Boulevard that would move people faster and more safely. This design pictured below takes up the same amount of space as the proposed design, pictured above. Federal has a lot of room and moves a lot of people. Problem is, those people move inefficiently during rush hour and dangerously during off-peak times. True BRT, with dedicated bus lanes and stations in the center of the street, would act like RTD’s rail system. Riders would traverse traffic jams and drivers wouldn’t get stuck behind buses, eliminating the perceived need for six car lanes. Its convenience would attract would-be drivers, while more medians and signalized crosswalks would keep pedestrians safer. Instead, DPW and CDOT are encouraging inefficiency by creating space for the least efficient mode of travel — single occupancy vehicles — while ignoring other modes. Widening lanes for single-occupancy vehicles instead of investing in infrastructure that makes other modes attractive is short-sighted. Denver’s population is growing, commuters are trending away from cars, yet the city is investing millions to make more space for them. When that space fills up, then what? Federal Blvd is one of the busiest transit corridors in the city. It also runs through some of the lowest income neighborhoods in the city. Don’t those riders deserve more? Welcome to Denver – where the Hancock Administration thinks CITY is a 4-letter word! I went to nearly all of the public meetings on this expansion held over the last several years, and I think many people were there asking for more landscaping and a safer/friendlier pedestrian environment. Sadly, the city seems to have only minimally considered these needs. They have also failed to repair the non-functioning crosswalk signals at 8th and 10th for several months (despite multiple 311 contacts), which I guess speaks to how much they value pedestrian safety.